Users of Sensear I.S. headsets benefit from clear communications while still protecting their hearing and remaining aware of the surrounding work environment. Whether using the headset’s wired or wireless I.S. capabilities, the wearer is free to move in and out of hazardous (classified) locations.By recognizing the different properties of speech and background noise, Sensear’s industry-changing SENS™ technology simultaneously combines speech enhancement with noise suppression to deliver a total high noise communications and protection solution.SENS™ enables users to remain aware of their surroundings, including directional noise perception, communicate in noisy environments, and protect their hearing from harmful noise levels. Sensear I.S. 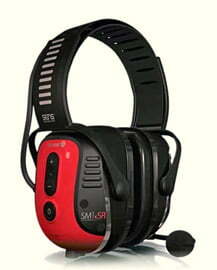 smart muffs enable multiple modes of communication and are available in three wearing configurations. Operation is by integral push buttons on the muff covers. -20°C ≤ Ta ≤ +40°C. Ex ia IIB T3, -20°C ≤ Ta ≤ +40°C.